There are no easy answers to life’s challenges. The quest to find happiness and meaning in life is not now. Humans have been pondering the reason for our existence for thousands of years. There are no quick fixes for the fundamental problems of life but this book will offer you tools, which will help you make good choices, appropriate to the circumstances of your life. There are hundreds of advisory institutions who have advice for how you should live your life, make your career choice or make yourself happy. In the self-help section of the book stall, just walk in and you will be overwhelmed with the number of choices about how you can improve your life. You know all these books cannot be right. How do you know what is good advice and what is bad for your personality traits? This book is based on thoughts which are expressed in the form of success stories, anecdotes, theories, concepts, principles, therapies and cartoons. And for every expression there is a Model, picture, graph, chart, diagram or the geometrical figure. In fact it is a pictorial presentation of thoughts. This book depicts more than 100 thoughts which will help shaping your life. Thinking is a craft. 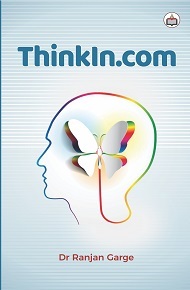 I do not promise this book will offer you any easy answer to learn ‘How to think’. Working through these thoughts requires hard work. I hope the theories, stories, and cartoons in this book can help you as you continue on your journey, so that in the end, you can definitely answer for yourself the question “How will you measure your life?”. Dr Ranjan Garge is a Microbiologist, Journalist, Mountaineer, Environmentalist, Educationist, Social workerand Outdoor Management Expert., He was Director, Pre IAS training institute, Aurangabad [2004-06], and retired as aPrincipal, Government college of Arts and Science, Aurangabad . Now, Director, COSMOS Outward Bound Pioneers, Aurangabad. He is a Social trainer, gives motivational speeches and conducts workshops. Dr Ranjan is in the field of Management consultancy since last 25 years. His core trainingareas are Outdoor Management Development [OMD], Science of Change, Science communication, Emotional intelligence and conducts Faculty Improvement programme for teachers. He has been awarded a silver medal in Mountaineering at the hands of then President of India Dr V V Giri in 1973 and Best Trekker of Maharashtra at the hands of C M of Maharashtra Mr. Vasant Patil in 1983. His book on Mountaineering received the “Best literature Award” instituted by Government of Maharashtra, 1993. A prolific writer, he has written Twenty books on popular science, and management. His recent books are “Management through the woods and over the rivers” published by Notionpress.com, Chennai, 2016, “Communicating science –Wi-Fi to Sci-Fi” published by Authorspress, New Delhi, 2017. And “Sustainable development”, 2017. He is the Recipient of “Rising personality of India award” instituted by Penguin Publishing house.and “Bharat Gauraw Award” of Industrial Economic forum of India.He stands listed in Reference Asia, Worlds Who’s Whoand is a Rotarian of 30 years of standing.